Gilt customs and excise standard no 1 (Sikes) hydrometer by J J Hicks in mahogany box. Range 0 - 10. Hydrometers are used to measure the relative density of a liquid and are particularly used for establishing the alcoholic content of liquids. A hydrometer will float higher in a heavy liquid, such as one that has a high quantity of sugar. A less heavy liquid, where the sugar has been turned into alcohol, will make the hydrometer float lower. 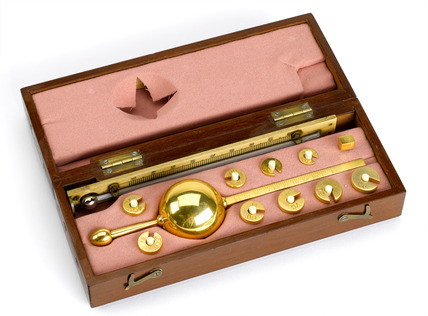 Sikes's hydrometers were covered with a body of fine gold to help prevent corrosion. Hydrometers are still used in wine making today.